“Remember, other people don’t have to ‘get’ your dream. It’s not theirs–it’s yours. –Dr. Clarence M. Lee, Jr.
Godly single parents have been taking it on the chin in our mainstream (and social media) for a number of years. Even many of our churches have mistakenly pushed the upright ones off to the side. Godly single parents have grown to be marginalized because they don’t fit the agenda template to wipe God from the marketplace. 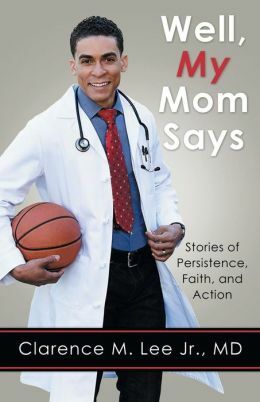 Enter Dr. Clarence M. Lee, Jr. with his work: “Well My Mom Says” (173 pages, 2014, WestBow Press) to set the scales of faith in God, parental love and common sense back to a right balance. All one can say as they read this work is: “Wow!” “Well My Mom Says” sports 25 chapters, divided into four power-packed sections. It’s a book that will make a great reference book for young people, and will make many a parent ‘get their voices back’ concerning needed advice, wisdom and training for their children that many thought had been relegated to the back pages of history. Lee ‘walks’ the reader through his various ‘growing pains’ that his mother had to address, as he was navigating the often-bumpy roads of life: Difficult teachers, hard life choices and honorable dreams in a warped society. Eventually, Lee’s mother remarries–and the advice keeps on coming from his stepfather. Nevertheless, the advice is more profound and more needed by a ‘double dose’ of parental love. Lee, a medical doctor makes no apologies for being a Christian nor a former college athlete. Chapters deal with the subjects of Trust, Faith, Perseverance and Appreciation. This book may also serve as a ‘kickstarter’ for some adults in the audience! In an interview with On Line Reviews, Lee noted that this work was ‘on time’ for a lot of young people in our present society…some of whom have been raised in a single-parent environment. He also noted that there is a good possibility that a workbook will be designed to be used along with the book in the near future. “Well MY Mom Says” is one of those books that you can’t finish in an afternoon. In fact, it’s one of those books that would best be considered a ‘reference’ work, because you will refer to it again, and again…with pencil or highlighter in hand. It’s available through your favorite on line bookseller, or through Lee’s website at www.cmleejr.com. Hey Buddy!, I found this information for you: "ON LINE REVIEWS BY MIKE RAMEY: “WELL, MY MOM SAYS” BY CLARENCE M. LEE, JR., MD". Here is the website link: https://blackmeninamerica.com/on-line-reviews-by-mike-ramey-well-my-mom-says-by-clarence-m-lee-jr-md/. Thank you.